The EXACT Fulfillment of the 1290 and 1335 Days Prophecy and More! A Realized Eschatological View and Commentary of Daniel 12: The Unequaled Distress of Israel’s War with Rome . . . The “A.D. 70 Doctrine” View, Interpretation, Exposition and Commentary of Daniel 12:1: The rise of Michael in v. 1 is described in Revelation 12:7-9. Here Michael and His Angels fight against the Devil and His Army. A War was seen in the Sky at the Start of the Jewish War. The rise of Michael mentioned at the beginning of the v. 1 may be recorded in greater detail in Revelation 12:7-9. In these verses, John describes a war in heaven in which Michael and his angels fight against the Devil and his army. A mass vision of this war seems to have been seen in the skies over Israel according to the Roman historian Tacitus. In The Histories he writes, “In the sky appeared a vision of armies in conflict, of glittering armour.”3 This mysterious phenomenon is recorded to have occurred in Iyyar of A.D. 66–the exact month and year in which the Jews began their revolt against Rome.4 As stated above, the war that followed was a massacre. 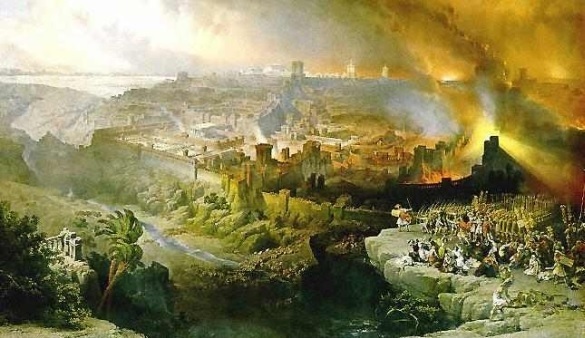 The Romans left Israel a charred, desolate wasteland. 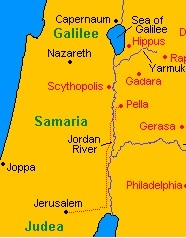 The capital city of Jerusalem and many other cities throughout the province were reduced to rubble, and the death toll was catastrophic. As disastrous as things were, a significant segment of the Jewish population survived. Byzantine church ruins in Pella, Jordan. Courtesy of DavidThomas71. 2Multitudes who sleep in the dust of the earth will awake: some to everlasting life, others to shame and everlasting contempt. 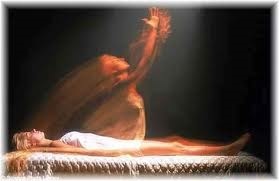 Daniel Chapter 12:2: A Preterist Commentary: A Multitude of Spiritual Bodies were seen and heard rising out of the Earth at the Sound of a Trumpet in what appears to be the Resurrection of the Dead during the Jewish War. According to 1 Corinthians 15:52 there was to be a mass resurrection at the last trumpet. The final trumpet mentioned in this verse appears to be the seventh trumpet described in Revelation 11:14.7 The sounding of this trumpet corresponds precisely with the sounding of the Roman trumpets signaling the start of the Roman attack on Jerusalem on Passover of A.D. 70. I believe that the woman representing the saints of Revelation 12:6 and Revelation 12:14 also represents the departed saints awaiting the resurrection to heaven. This woman was to be kept safe from the Devil for 1260 days or three and a half years, thus I believe that the resurrection may have begun approximately three and a half years before these spirits finally entered heaven at the last trumpet in A.D. 70. Though it is impossible to precisely pinpoint when this vision of what appears to be the resurrection transpired, it seems to have occured around three years and six months before the start of the siege of Jerusalem on Passover of A.D. 70 at the sounding of the seventh trumpet. For an in-depth discussion of the miraculous historical fulfillment of the resurrection including the historical evidence in favor of this miraculous event see 1 Corinthians 15:50-54 and 1 Thessalonians 4:13-18: A Preterist Commentary. Also for a detailed explanation of how this event literally fulfills all Biblical expectations concerning the resurrection see the following articles: The Notion that the Resurrection is an Earthly Phenomenon whereby the Dead are raised as Perfected, Eternal Earthly Bodies is dispelled by 1 Corinthians 15:35-50 and Isaiah 65:20, How the Resurrection Bodies of the Saints Perfectly Mirror Jesus’ Resurrection Body after His Ascension Into Heaven Fulfilling Philippians 3:20-21 and ALL Other Bible Verses on the Resurrection!! !, and Understanding the Garden of Eden and the Fall from an Old Earth Perspective. 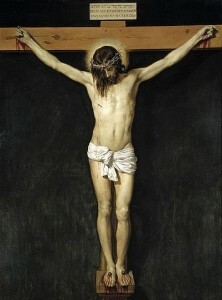 The above links discuss how the resurrection is a mirror opposite of the fall and how the Bible teaches that the resurrection of the saints then and now is a resurrection of perfected heavenly bodies that mirror Biblical descriptions of Jesus’ resurrection body after his ascension into heaven as it is described in Acts 9:3-6 and Revelation 1:13-16. After his ascension into heaven, Jesus’ resurrection body was further glorified according to Acts 9:3-6 and Revelation 1:13-16 such that it resembled the beings of heaven–beaming with glorious radiance. 3Those who are wise will shine like the brightness of the heavens, and those who lead many to righteousness, like the stars for ever and ever. Daniel Chapter 12:3: A Preterist Commentary: According to the Bible and confirmed by Near-Death Experiences, Beings in Heaven are Beings of Light. Continuing to discuss the resurrection as he had in the previous verse, Daniel then hints upon the luminescent nature of the glorified resurrection body in v. 3: “Those who are wise will shine like the brightness of the heavens, and those who lead many to righteousness, like the stars for ever and ever.” This radiant heavenly resurrection body of the saints matches Jesus’ resurrection body after his ascension into heaven in Acts 1. 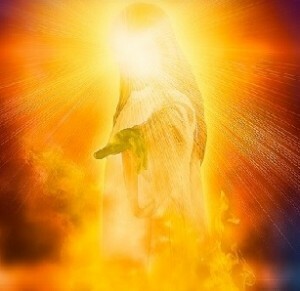 After Jesus ascended into heaven He later appeared as a being of light according to Acts 9:3-6 and Revelation 1:13-16. After also ascending into heaven at the resurrection (Philippians 3:20-21), the resurrection bodies of the saints are expected to experience a similar luminous transformation according to Daniel 12:3. Matthew 13:43 echoes Daniel 12:3: “Then the righteous will shine like the sun in the kingdom of their Father.” Near-death experiences (NDE’s) confirm Daniel 12:3 and Matthew 13:43. It is commonly reported by people who have had NDE’s that beings in heaven look like beings of light, while spirits in hell emanate very little light such that they appear black or gray. Therefore, what is stated in Matthew 13:43 and Daniel 12:3 appears to be correct: After the resurrection, the wise and righteous will literally shine like the sun and stars in heaven. Here Daniel reveals the source of his revelations: a heavenly scroll. The scroll sealed in this v. is the same scroll opened by the Lamb at the beginning of Revelation. This fact helps explain the similar symbolism, content and writing style shared in these two books. According to v. 4, this scroll is to remain sealed until “the time of the end.” If it is true that both prophets received their information from the same heavenly scroll, it can then be concluded that the Book of Revelation was written during the end time. The increase in knowledge predicted in v. 4 to a large extent is due to the unsealing of the information on the scroll sealed in this verse. The increase in knowledge at the end of the age may also be said to be fulfilled in Romans 16:25-26, Ephesians 3:3-5 and Ephesians 3:9-10. A Time, Times and Half a Time is Three and a Half Years, the Interval between the arrival of the Roman Army in Israel to the Siege of Jerusalem. Daniel Chapter 12:7: A Preterist Commentary: A Time, Times and Half a Time is Three and a Half Years, the Interval between the arrival of the Roman Army in Israel to the Siege of Jerusalem. “[A] time, times and half a time” is an esoteric way of denoting a three and a half year interval. This three and a half year interval appears to be the time in which Vespasian and Titus arrived in Israel with the Roman legions until the fall of Jerusalem in A.D. 70 which spanned exactly three and a half years. Jesus was crucified on Passover. A Covenant Eschatology Interpretation and Commentary of Daniel 12:7: Who are the Holy People mentioned in v. 7? Who are the holy people mentioned in v. 7? The holy people of v. 7 are most-likely the Jews who were punished at the time of the end during Titus’ three and a half year military campaign. Though the Jews are God’s holy people, one might object to the idea that the holy people of v. 7 are the Jews punished during the Jewish War since these first-century Jews were punished at that time precisely because they were not holy. That being said, it is still most-likely the case that the holy people of v. 7 are the Jews. In Revelation 11:1-2 adulterous Jerusalem is called “the holy city” even though she was not holy. The fact that adulterous first-century Jerusalem is the “holy” city mentioned in Revelation 11 is confirmed by the reference to the Temple in vs. 1-2 and the fact that this was where Jesus was crucified (Revelation 11:8). Interestingly, “Jerusalem the holy” was inscribed on silver shekels minted during the Jewish War.10 Perhaps apostate Jerusalem is called “holy” because of its past Biblical and religious significance, or maybe it is a sarcastic or ironic reference to the perceived holiness of its wicked occupants as illustrated by the markings on Israelite money at the time? 8I heard, but I did not understand. So I asked, “My lord, what will the outcome of all this be?” 9He replied, “Go your way, Daniel, because the words are closed up and sealed until the time of the end. 10Many will be purified, made spotless and refined, but the wicked will continue to be wicked. None of the wicked will understand, but those who are wise will understand. 11“From the time that the daily sacrifice is abolished and the abomination that causes desolation is set up, there will be 1,290 days. Daniel 12:11 is ambiguous. Was there to be 1,290 days from the cessation of the daily sacrifice to Caesar and the concurrent abomination that causes desolation until some unspecified event? Or was there to be 1,290 days from the daily sacrifice to Caesar until the abomination that causes desolation? And if the abomination that causes desolation is the starting point, then what is the end of the 1,290 days? If the abomination that causes desolation is not the end point of v. 11, then Daniel does not specify what would happen at the end of the 1,290 days.12 Was the abomination that causes desolation to be the starting point, the end point, or both? I believe this ambiguity is intentional because both interpretations seem to have been fulfilled during the Jewish War. The abomination that causes desolation seems to be both the starting and ending point. 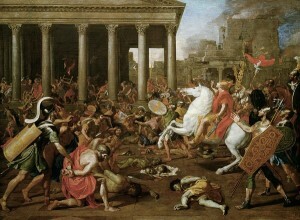 Around the 6th of Av of A.D. 66, Eleazar terminated the daily sacrifice to Caesar fulfilling part of v. 11.13 According to Josephus, this act “was the true beginning of our war with the Romans.”14 Hearing about this act of sedition, Agrippa immediately dispatched three thousand horsemen who seized the upper city, Mt. Zion, where they attacked the Jewish rebels who possessed the lower city and Temple.15 The Roman army with their idols to Zeus, Caesar and Rome is the abomination that causes desolation. See How the Greek (2nd Century B.C.) and Roman Armies (1st Century A.D.) with Their Idols of Zeus Literally fulfill All Bible Prophecies Concerning the Abomination that Causes Desolation. Thus immediately after Eleazar put an end to the daily sacrifice to Caesar, Roman auxiliaries, the abomination that causes desolation, entered Jerusalem. Thus the starting point of the 1,290 days is the termination of the daily sacrifice to Caesar and the consequent abomination that causes desolation which occurred immediately thereafter. Prophecies in the Bible often have multiple fulfillments. For example, the child born of a virgin in Isaiah 7:14 was fulfilled both in Isaiah 8:3 when the prophetess gave birth to a son and again with the virgin birth of Christ according to the gospels. Daniel 12:12 appears to be another example in which a prophecy may be fulfilled more than once. 1335 days are roughly three and a half years (3.66 years). Recall that Daniel 9:27 says that the prince to come will “confirm a covenant with many for one ‘seven[,]’ [and i]n the middle of the ‘seven’ he will put an end to sacrifice and offering.” These “sevens” are seven-year intervals. As explained in the commentary on Daniel 7, Daniel 9:27 was fulfilled in the fact that the siege of Jerusalem divided the Jewish War into two three and a half year intervals. (Recall that the Jewish War did not truly end until the fall of Masada in A.D. 74.) 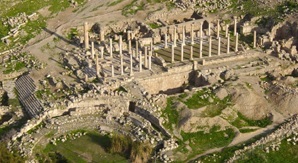 If the abomination that causes desolation of Daniel 9:27 was truly fulfilled in the destruction of the Temple which permanently “put an end to sacrifice and offering,” then this fact means that the destruction of the Temple and the fall of Jerusalem in A.D. 70 cannot mark the complete consummation of all Biblical prophecy. According to Daniel 9:27 after A.D. 70 there is still another three and a half year interval that must be accounted for. Since it is true that the Jewish War was a roughly seven years in length and could therefore be divided into two roughly three and a half year intervals, then perhaps the 1335 days (or 3.66years) of v. 12 has a dual fulfillment–one spanning the first half of the war and the secondary fulfillment extending to the second half? Not surprisingly, the events of the Jewish War appear to confirm this idea. Daniel Chapter 12:12: A Preterist Commentary: There were EXACTLY 1,335 Days from the Abolition of the Daily Sacrifice to Caesar in Av of A.D. 66 until the beginning of the Siege of Jerusalem on Passover of A.D. 70. Preterism, A Commentary of Daniel 12:12: There were also EXACTLY 1,335 Days from the 9th of Av of A.D. 70 when the Roman Army worshiped Idols of Zeus, Rome and Caesar on the Eastern Gate of the Temple until the First Day of Peace at the End of the Jewish War on the 16th of Nisan in A.D. 74. On the 9th of Av of A.D. 70, the Roman army broke into the Temple, set it on fire then set up the ensigns on the eastern gate of the Temple and worshipped them in an abominable ceremony that mimics Ezekiel 46:1-12. One month after the destruction of the temple, Jerusalem fell; and the war seemed to be over. The Jewish resistance appeared to be crushed and the province of Judea was relatively quiet with just a few small scattered confrontations. 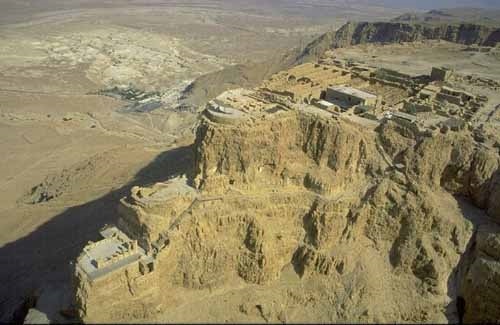 The last pocket of Jewish rebels held out at Herod’s mountain fortress of Masada. Determined to put an end to the rebellion, Flavius Silva, the Roman procurator, gathered an army and headed for Masada. The Fortress of Masada. There were also EXACTLY 1,335 days from the destruction of the Temple until the first day of peace after the fall of Masada at the end of the Jewish War on the 16th of Nisan in A.D. 74. Daniel Chapter 12:13: A Preterist Commentary: The Rest before the Resurrection . . .
Exiled on the island of Patmos, the Apostle John beholds a vision of the Lion of the tribe of Judah breaking each of the seven seals of the scroll; and with this act, the secrets of God’s plan for humanity is revealed. Upon the opening of the scroll, the final climactic events which fulfill the prophetic message of the Law and Prophets are immediately set in motion. The details of the coming judgment are recorded in the last book of the Bible, the Book of Revelation. In the pages of this book that which had been kept hidden from Daniel is finally revealed. And again the course of human events does not deviate from the path laid out for it on the script of the heavenly scroll. Written sometime around 530 B.C., the Book of Daniel highlights six hundred years of Jewish history without ever seeming to have made the slightest mistake. Each prophecy unfolded exactly as described in Daniel’s visions. Perhaps more than any other book ever written, the Book of Daniel clearly displays signs of having been influenced by something beyond this world. How could one man accurately predict six hundred years of history? Upon the realization of things kept secret from mankind, a supreme wisdom is made manifest, a wisdom that points to something or someone deeply involved in and in tight control of the course of human affairs—that something or someone I believe is God. In the above preterist commentary on Daniel chapter 12 the historical fulfillment of Daniel 12 is shown to have literally occurred in the first century including the 1335 and 1290 days prophecy of Daniel 12:11-12. Josephus The Wars of the Jews Preface 4. This verse also speaks of the resurrection of the dead. In the Book of Revelation, John describes seven plagues initiated by the blowing of seven trumpets and the pouring out of seven bowls. The seven trumpets and the seven bowls describe identical events from a slightly different perspective. Thus the seventh trumpet corresponds with the seventh bowl of Revelation 16. As is discussed in the commentary on Revelation 16:17-21, the pouring out of the seventh bowl results in the siege of Jerusalem. Cassius Dio Roman History 63.16. Suetonius Lives of the Twelve Caesars 6.19. Ralph P. Martin and Lynn Allan Losie, gen. eds., Word Biblical Commentary, vol. 52B, Revelation 6-16, by David E. Aune (Grand Rapids: Zondervan, 1998), 608. It is also possible that the holy people mentioned in v. 7 are the saints. In Revelation 6:10 the martyred saints ask God how long will it be before He avenges their unjust deaths: “They called out in a loud voice, ‘How long, Sovereign Lord, holy and true, until you judge the inhabitants of the earth and avenge our blood?’” These martyrs “were told to wait a little longer, until the full number of their fellow servants, their brothers and sisters, were killed just as they had been (Revelation 6:11).” Here one can see that God would enact His judgments at the time of the end when all those who were to be martyred were killed. In other words, the events that fulfilled God’s vengeance at the time of the end would occur “[w]hen the power of the holy people has been finally broken” as predicted in Daniel 12:7. In light of Revelation 6:9-11, Revelation 17:6 and Matthew 23:34-39 it is also possible that the shattering of the holy people in Daniel 12:7 was fulfilled in the martyrdom of the Christian saints which according to Revelation 6:9-11 triggered God’s wrath resulting in the events of the eschaton. The breaking of the power of the holy people in v. 7 may refer to the war with Rome or the persecution of the church. First century Christians had been killed after Jesus’ death both in Israel and in Rome. Acts 7:55-58, 8:1; Eusebius The History of the Church 2.23-25. Though the exact duration of Nero’s persecution is unknown, it is quite possible that it had spanned a course of three and one-half years, though it need not be in order to fulfill Biblical prophecy. During this persecution, Christians were burned on crosses and ripped apart by dogs. (Tacitus Annals 15:44.) The Neronic persecution likely began around July of A.D. 64. Over time many Romans became sympathetic to the harsh way in which Christians were treated. Nero died in early June of A.D. 68. Perhaps this persecution ended in January of A.D. 68 at the start of the revolt in Gaul. This revolt weakened Nero’s grip on Rome and the populace became increasingly defiant. Sensing the increasing loss of public loyalty, Nero may have ceased public executions so as not to increase public displeasure and cater to his concerns of being deposed. The weakness with this view is the word power. With the first view power clearly refers to the military might of the Jews. With the latter view it is less clear. Perhaps the power of the holy people in the latter view refers to “the full number” of martyrs who were to be killed (Revelation 6:11)? John S. Evans, The Four Kingdoms of Daniel: A Defense of the “Roman” Sequence with AD 70 Fulfillment, (USA: Xulon Press, 2004), 290. Josephus The Wars of the Jews 2.17.2-7. In The Wars of the Jews 2.17.7, Josephus says the assault on Antonia began on the 15th of Av. The day before was the 14th of Av, the festival of Xylophory, mentioned in The Wars of the Jews 2.17.6. In The Wars of the Jews 2.17.5-6, Josephus says there were seven days of fighting until the 13th of Av. Counting back seven days from the 13th of Av places the cessation of the sacrifice to Caesar mentioned in The Wars of the Jews 2.17.2 seemingly on the 6th of Av. Josephus The Wars of the Jews 2.17.2. Edward E. Stevens, First Century Events in Chronological Order: From the Birth of Christ to the Destruction of Jerusalem in A.D. 70, (Pre-publication manuscript, 2008), 59-60. Here Stevens places the arrival of Titus and his army 2 months before the start of the siege of Jerusalem on Passover of A.D. 70. This is the month of Shabat. There were 354 days per year in the Hebrew lunar calendar. The time between the old and new moon is roughly 29.5 days and because there were 12 months in a lunar year, each year was expected to be 354 days long with each month alternating between 29 and 30 days. However, another month was added to the calendar approximately every three years in order to prevent seasonal overlap. Assuming a standard 354 day lunar year with a 29 day leap month sometime within these three and one half years, there is exactly 1335 days from the 6th day of Av in A.D. 66 until the first day of Passover, the 14th of Nisan of A.D. 70. 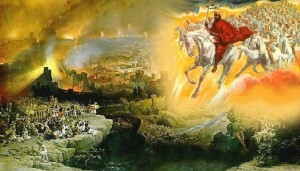 (Leviticus 23:5) According to Josephus, the Romans began their siege of Jerusalem on Passover. (Josephus The Wars of the Jews 5.3.1-5) A couple things must be clarified in this calculation. First, this calculation assumes that the daily sacrifice to Caesar ceased on the 6th of Av of A.D. 66. The logic behind this date is explained in the footnote above. Second, this calculation assumes that the Romans began their siege on the 14th of Nisan as seems to be implied in The Wars of the Jews 5.3.1-5. Second, this calculation assumes a 29 day leap month which is a possibility because the Hebrew lunar calendar was not fixed until the 4th century A.D. Before this time, the length of each month was set by the Sanhedrin and would alternate between 29 and 30 days because the time between the old and new moon approximates 29.5 days. The length of each month was determined when the new moon of the next month was first seen. Thus there was some flexibility in the calendar in which one might expect the leap month to vary between 29 and 30 days depending on when the new moon was first seen to mark the following month. See http://www.chabad.org/library/article_cdo/aid/526874/jewish/The-Jewish-Month.htm (2/2/14). Josephus The Wars of the Jews 7.9.1. There were 354 days per year in the Hebrew lunar calendar. However, another month was added to the calendar approximately every three years in order to prevent seasonal overlap. Assuming a standard 354 day lunar year with a 30 day leap month sometime within these three and one half years, there is exactly 1335 days from the 9th day of Av in A.D. 70 until the day after Passover, the 16th of Nisan, in A.D. 74, the first official day of peace after the war. Josephus says that the 960 Jewish rebels at Masada committed suicide on the “fifteenth day of the month of Xanthicus [Nisan].” (Josephus The Wars of the Jews 7.9.1) Therefore, the first day of peace was the 16th of Nisan of A.D. 74. It is important to note that the Hebrew lunar calendar was not fixed until Hillel, 4th century A.D. Before Hillel, there was no fixed calendar. In other words, it was impossible to determine with certainty when the next month would start. Each month, the Sanhedrin would dictate whether a month would be 29 or 30 days in length. The length of each month was determined when the following month’s new moon was first seen. Thus there was some flexibility in the calendar in which one might expect the leap month to vary between 29 and 30 days depending on when the new moon was first seen to mark the following month because the time between the old and new moon is roughly 29.5 days. Since there were 12 months in a lunar year, each year was expected to be 354 days long with each month alternating between 29 and 30 days. See http://www.chabad.org/library/article_cdo/aid/526874/jewish/The-Jewish-Month.htm (2/2/14). Daniel presumably enters heaven with the saints at the seventh trumpet at the start of the siege of Jerusalem. I believe internal evidence strongly suggests that the Book of Revelation was most likely written during or just prior to the Neronic persecution in A.D. 64. For a well-argued case for an early date of composition see Kenneth L. Gentry, Jr., Before Jerusalem Fell: Dating the Book of Revelation (Powder Springs, GA: American Vision, 1998). in my wolfram alpa app it calculates “9 av, ad70 – 16 nissan, ad74” as 1366 days, not 1335.
not sure if the time span displayed uses a calendar other than the jewish one. i’ve also sent feedback to wolfram asking which calendar is being used to display the time span. Hi Kevin, I rechecked my calculations and I still get 1335 days. These calculations are based off the Hebrew lunar calendar in which months alternate between 29 and 30 days making a 354 day year. Any calculation of time when it is written in Hebrew months must be calculated with the Hebrew calendar, converting to Gregorian dates and then calculating an interval is less accurate. I then went on a website that converts Hebrew dates into the Gregorian calendar and surprisingly still got 1335 days (though that surprised me because it is impossible to convert Hebrew to Gregorian with 100 % accuracy because there was no fixed calendar at the time. In other words the duration of each month was determined by the Sanhedrin based on the appearance of a new moon.) The site I used was http://www.hebcal.com/converter/?hd=16&hm=Nisan&hy=3834&h2g=1 Date calculators can be inaccurate because of the reason stated above in addition to the fact that it would be impossible (as far as I can tell) to know exactly what yr a leap month would be added (though it should occur roughly every three yrs or so).